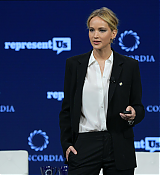 On September 25, Jennifer Lawrence attended the 2018 Concordia Annual Summit – Day 2 in New York City and she had a lot to say about her absence. 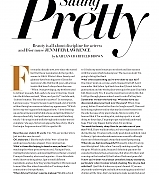 Lawrence is taking a year off acting, as she announced in March. In that time she’s been working with Represent.Us, a bipartisan effort to pass anti-corruption legislation at a state level that also calls Adam McKay and David O. Russellboard members. And that’s what brought her here, to this expansive hotel in Midtown Manhattan, where discussions of fair-labor supply chains and PowerPoints titled “Us vs. Them: The Failure of Globalism” ruled the day. “It could have been age, it could have been the election,” she told CBS’s Gayle King,the interviewer on hand, who asked what inspired her to take her leave. “Two years ago was when the passion for politics really started growing, and the more I was educated and educated myself, I realized the most important thing that a political movement can have is support from the right and left.” Their chat followed a TED Talk–like PowerPoint of her own, along with Josh Lynn, the managing director and co-founder of Represent.Us, that laid out a plan for how to combat widespread corruption in Washington via lobbies and dark money.